↑ १.० १.१ १.२ Jha, M. (1997). "Hindu Kingdoms at contextual level". Anthropology of Ancient Hindu Kingdoms: A Study in Civilizational Perspective. New Delhi: M.D. Publications Pvt. Ltd. pp. 27–42. https://books.google.com/books?id=A0i94Z5C8HMC&lpg=PA30&pg=PA27#v=onepage&q&f=false. ↑ Mishra, V. (1979). Cultural Heritage of Mithila. Allahabad: Mithila Prakasana. pp. 13. https://books.google.co.uk/books?redir_esc=y&id=8FBuAAAAMAAJ&focus=searchwithinvolume&q=area+of+mithila. अन्तिम पहुँच तिथि: 28 December 2016. ↑ Jha, M. (1997). "Hindu Kingdoms at textual level". 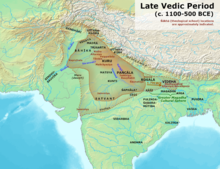 Anthropology of Ancient Hindu Kingdoms: A Study in Civilizational Perspective. New Delhi: M.D. Publications Pvt. Ltd. https://books.google.co.uk/books?id=A0i94Z5C8HMC&lpg=PA30&pg=PA43#v=snippet&q=Darbhanga&f=false. ↑ Kumāra, Braja Bihārī (1998) (enमे). Small States Syndrome in India. Concept Publishing Company. आइएसबिएन 9788170226918. https://books.google.co.uk/books?id=nKqF_AgDd4gC&pg=PA148&dq=mithila+india+state&hl=en&sa=X&ved=0ahUKEwiL0fDo2pXSAhVEKcAKHej6AicQ6AEIGjAA#v=onepage&q=mithila%2520india%2520state&f=false. ↑ Cust, R.N. (1901). "The Indian Hero". Linguistic and oriental essays: written from the year 1840 to 1903. London: Trübner & Co.. pp. 144–158. https://archive.org/details/cu31924026988570. अन्तिम पहुँच तिथि: 12 January 2017. ↑ Gupta, Ankur (2015-09-05) (utमे). Ashtavakra Gita: Unique Multilingual Sutras in Sanskrit, Roman Sanskrit, Hindi, English. Proman. https://books.google.com.np/books?id=HA2CCgAAQBAJ&printsec=frontcover&dq=Ashtavakra+Gita:Unique&hl=en&sa=X&redir_esc=y#v=snippet&q=Dhriti&f=false. ↑ Hamilton, Francis (1819) (enमे). Genealogies of the Hindus, Extracted from Their Sacred Writings: With an Introduction and Alphabetical Index. author. https://books.google.com.np/books?id=LyYPAAAAQAAJ&printsec=frontcover&dq=Genealogies+of+the+Hindus,+Extracted+from+Their+Sacred+Writings:+With+an+...&hl=en&sa=X&ved=0ahUKEwjS0trlmIvXAhXLsI8KHZI4A9EQ6AEIJDAA#v=onepage&q=Genealogies%2520of%2520the%2520Hindus%252C%2520Extracted%2520from%2520Their%2520Sacred%2520Writings%253A%2520With%2520an%2520...&f=false. ↑ Shrivastava, Anil (2014-08-28) (enमे). KING OF AYODHYA. Notion Press. आइएसबिएन 9789384381820. https://books.google.com.np/books?id=7VGpBAAAQBAJ&pg=PT29&dq=list+of+Janak&hl=en&sa=X&redir_esc=y#v=onepage&q=list%2520of%2520Janak&f=false. ↑ (Ed. ), Gajendra Thakur (hiमे). Videha Samalochna. Gajendra Thakur. https://books.google.com.np/books?id=kwfgewmFg5EC&pg=PA155&dq=%25E0%25A4%25AE%25E0%25A4%25BF%25E0%25A4%25A5%25E0%25A4%25BF%25E0%25A4%25B2%25E0%25A4%25BE%25E0%25A4%2595+%25E0%25A4%2587%25E0%25A4%25A4%25E0%25A4%25BF%25E0%25A4%25B9%25E0%25A4%25BE%25E0%25A4%25B8&hl=en&sa=X&ved=0ahUKEwjBkdHcn4vXAhUFsY8KHTtnAyEQ6AEIOjAD#v=onepage&q=%25E0%25A4%25AE%25E0%25A4%25BF%25E0%25A4%25A5%25E0%25A4%25BF%25E0%25A4%25B2%25E0%25A4%25BE%25E0%25A4%2595%2520%25E0%25A4%2587%25E0%25A4%25A4%25E0%25A4%25BF%25E0%25A4%25B9%25E0%25A4%25BE%25E0%25A4%25B8&f=false. ↑ Srivastava, Kamal Shankar (1999-01-01) (enमे). Art of Mithila. Book Faith India. आइएसबिएन 9788173031175. https://books.google.com.np/books?id=TS0xAQAAIAAJ&q=Mithila+after+the+Janakas&dq=Mithila+after+the+Janakas&hl=en&sa=X&ved=0ahUKEwi8x9OcmYzXAhUHp48KHWxBDEMQ6AEILjAC. ↑ Sinha, Chandreshwar Prasad Narayan (1979) (enमे). Mithila Under the Karnatas, C. 1097-1325 A.D. Janaki Prakashan. https://books.google.com.np/books?id=Os8BAAAAMAAJ&q=history+of+mithila&dq=history+of+mithila&hl=en&sa=X&redir_esc=y. ↑ Choudhary, Rabindra Nath (1987) (enमे). Political History of Khandavala Dynasity [sic in Mithila, 1556-1793]. Capital Publishing House. https://books.google.com.np/books?id=nmYeAAAAMAAJ&q=history+of+mithila&dq=history+of+mithila&hl=en&sa=X&redir_esc=y. ↑ Anthropology of Ancient Hindu Kingdoms: A Study in Civilizational Perspective. https://books.google.co.uk/books?id=A0i94Z5C8HMC&pg=PA55&dq=karnataka,+oinwars&hl=en&sa=X&ved=0ahUKEwj5xOfAyezQAhUsIcAKHWA6CVMQ6AEIHTAA#v=onepage&q=karnataka%2C%20oinwars&f=false. अन्तिम पहुँच तिथि: 11 December 2016. ↑ Wetlands management in North Bihar. https://books.google.co.uk/books?id=EzPYdQo3vZgC&pg=PA165&dq=darbhanga+capital&hl=en&sa=X&ved=0ahUKEwjz6p_Z5_TQAhXBCcAKHcACBNAQ6AEIPDAH#v=onepage&q=darbhanga%20capital&f=false. अन्तिम पहुँच तिथि: 14 December 2016. ↑ Anthropology of Ancient Hindu Kingdoms: A Study in Civilizational Perspective. https://books.google.co.uk/books?id=A0i94Z5C8HMC&pg=PA56&dq=darbhanga+capital+mithila&hl=en&sa=X&ved=0ahUKEwjaytH16PTQAhULLsAKHUJhDxoQ6AEIJzAD#v=onepage&q=darbhanga%20capital%20mithila&f=false. अन्तिम पहुँच तिथि: 14 December 2016. ↑ Jha, Arun Kumar (2005) (enमे). Some Aspects of the Cultural History of Mithila: The Janaka Dynasty, the Karnåatas & the Oinwåaras. University Department of History and A.I.H.C. & Archaeology, T.M. Bhagalpur University. https://books.google.com.np/books?id=NVtuAAAAMAAJ&q=history+of+mithila&dq=history+of+mithila&hl=en&sa=X&redir_esc=y. ↑ Thakur, Upendra (1956) (enमे). History of Mithila: (circa 3000 B.C.-1556 A.D.). Mithila Institute. https://books.google.com.np/books?id=YZo5AQAAIAAJ&q=history+of+mithila&dq=history+of+mithila&hl=en&sa=X&redir_esc=y.